This volume critically analyzes and explains the goals, processes, and effects of language policies in the United States and Canada from historical and contemporary perspectives. The focus of this book is to explore parallel and divergent developments in language policy and language rights in the two countries, especially in the past four decades, as a basis for reflection on what can be learned from one country's experience by the other. Effects of language policies and practices on majority and minority individuals and groups are evaluated. Differences in national and regional language situations in the U.S. and Canada are traced to historical and sociological, demographic, and legal factors which have sometimes been inappropriately generalized or ignored by ideologues. The point is to show that certain general principles of economics and sociology apply to the situations in both countries, but that differing notions of sovereignty, state and nation, ethnicity, pluralism, and multiculturalism have shaped attitudes and policies in significant ways. Understanding the bases for these varying attitudes and policies provides a clearer understanding of the idiosyncratic as well as more universal factors that contribute to tensions between groups and to outcomes, many of which are unintended. The volume makes clear that language matters always involve issues of culture, economics, politics, individual and group identities, and local and national histories. The chapters provide detailed analyses on a wide range of issues at the national, state/provincial, and local levels in both countries. The chapter authors come from a variety of academic disciplines (education, geography, journalism, law, linguistics, political science, and sociology), and the findings, taken together, contribute to an evolving, interdisciplinary theory of language policy. "Ricento and Burnaby offer a useful tool to policy makers to cut through the rhetoric of the 'English Only/English First' advocates, and the misconceptions on both sides of the border about the degree of success of bilingualism and multiculturalism in Canada…. "This book is an outstanding contribution to the literature on language policy, language planning, and language rights. 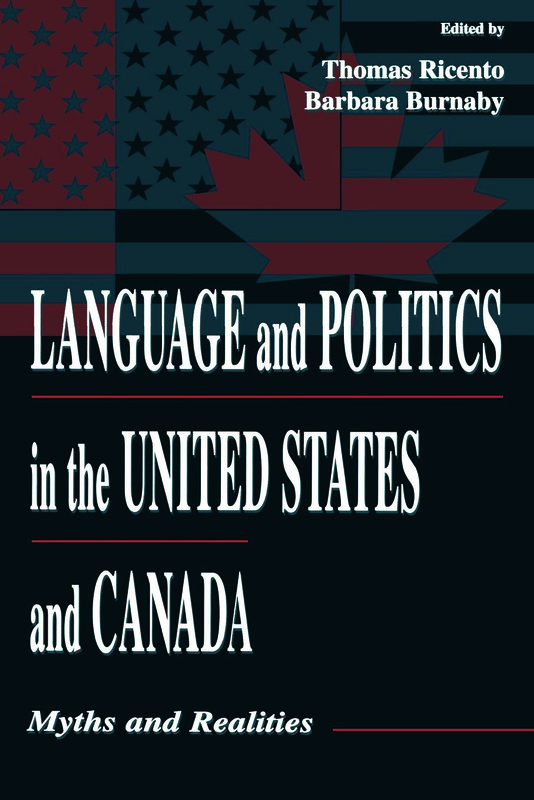 It provides a fascinating comparative treatment of developments related to issues of language and politics in the United States and Canada….The chapters are, without exception, well written and interesting." "Ricento and Burnaby offer a useful tool to policy makers to cut through the rhetoric of the 'English Only/English First'advocates, and the misconeptons on both sides of the border about the degree of success of bilingualism and multiculturalism in Canada….Language and Politics in the United States and Canada: Myths and Realities…is clearly a useful reference for graduate students, scholars, and policy makers." "This collection is first rate. It is the only collection I know that attempts a comparative analysis of language policy in the United States and Canada within a historical-structural framework….Its authors have detailed, up-to-date knowledge of the field, and are well grounded in research and relevant theory. The quality of scholarship is consistently high." Contents: Preface. C.H. Williams, Introduction: Respecting the Citizens--Reflections on Language Policy in Canada and the United States. Part I: Overviews. R. Schmidt, The Politics of Language in Canada and the United States: Explaining the Differences. R. Beaujot, Demographic Considerations in Canada Language Policy. T. Ricento, National Language Policy in the United States. Part II: Forgotten Tongues: Indigenous Languages in North America. M. Fettes, Life on the Edge: Canada's Aboriginal Languages Under Official Bilingualism. J. Crawford, Endangered Native American Languages: What Is to Be Done, and Why? Part III: Legal Implications of Official Language Policies. S. Miner, Legal Implications of the Official English Declaration. J.E. Magnet, Language Rights Theory in Canadian Perspective. Part IV: Educational Perspectives. T.G. Wiley, The Imposition of World War I Era English-Only Policies and the Fate of German in North America. B. Burnaby, ESL Policy in Canada and the United States: Basis for Comparison. Part V: Focus on Context. D. Cartwright, French-Language Services in Ontario: A Policy of "Overly Prudent Gradualism?" C. Veltman, Quebec, Canada, and the United States: Social Reality and Language Rights. T. Ricento, Partitioning by Language: Whose Rights Are Threatened? B. Burnaby, T. Ricento, Conclusion: Myths and Realities.